The list of files from the Conservative Party Archive at the Bodleian Library which will be declassified on 1st January, 2014 under the ’30-year rule’ is now available, here. 274 files have been opened up for research, encompassing all files deposited under general access restrictions whose end-date is 31st December, 1983 or earlier that year. Being an election year, many of these files from 1983 are naturally devoted to the 1983 General Election preparations. 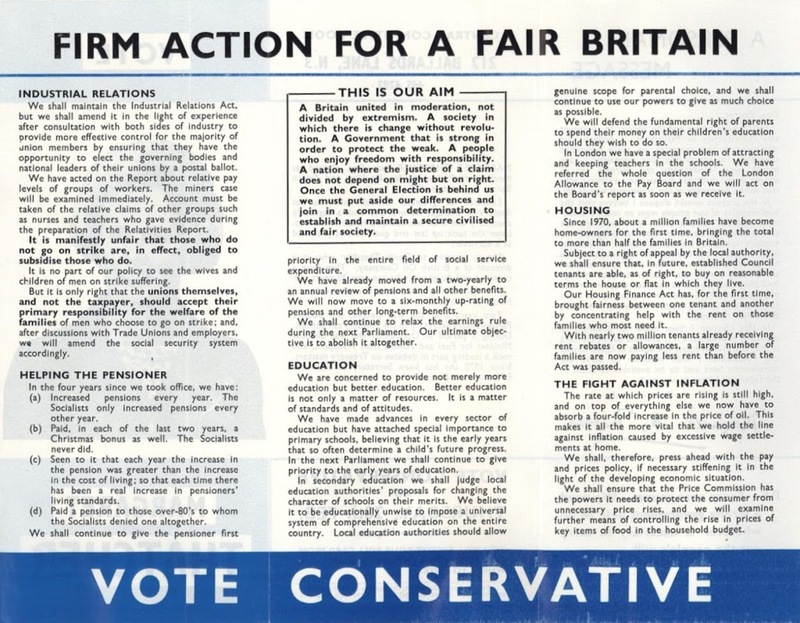 More are preoccupied with the major policy review undertaken by the Conservative Party as it neared the end of Thatcher’s second Government, the focus of these policy groups indicating the priorities for inclusion in the next election manifesto: Promotion of Enterprise; Inner Cities; Transport; Europe; Law and Order; Tax and Social Security; Education; Employment Policy; Family; and Nationalised Industries. 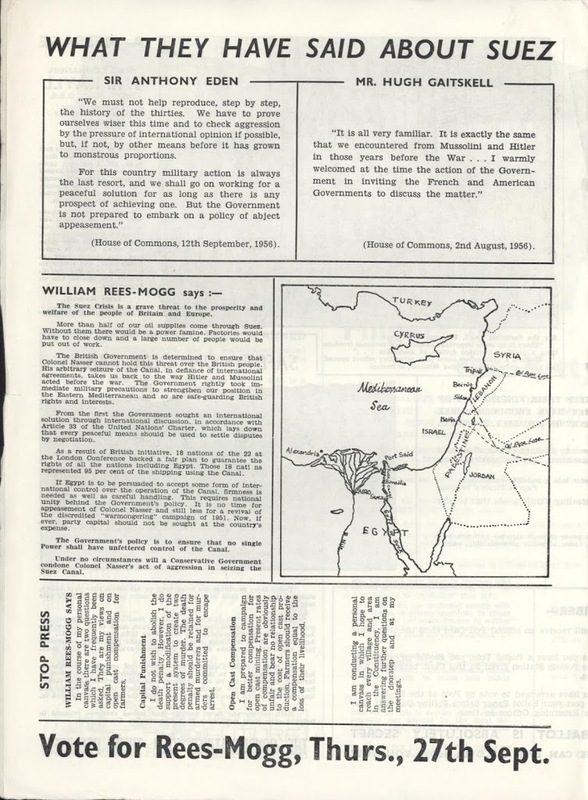 Papers from the Party’s International Office provide an insight into the formation of the International Democrat Union (IDU) – the alliance of centre-Right Conservative and Christian Democrat political parties – in London in 1983. 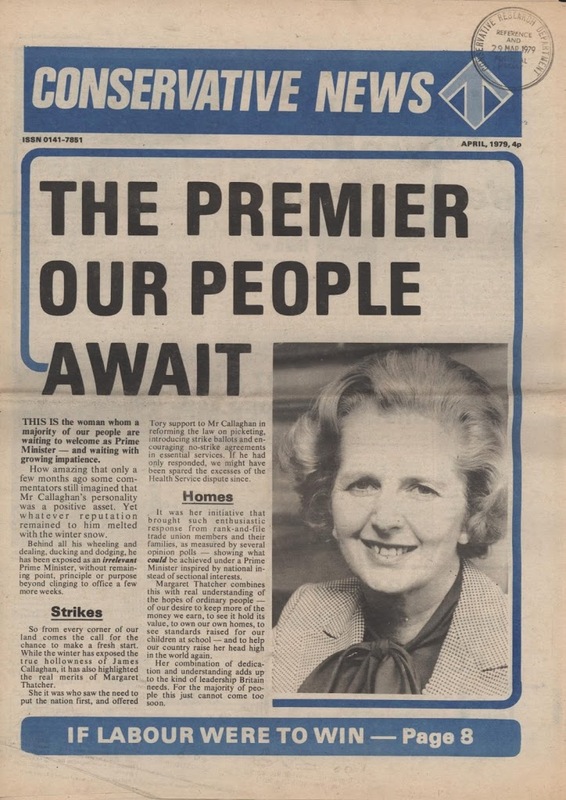 The Conservative Party was a founding member of the IDU, which provided an international dimension to the European Democrat Union which was founded in 1978. Similarly, papers are now available on the Conservative Party’s bilateral relations with other centre-Right parties, notably in France, West Germany, the Netherlands, Norway, Canada and the United States. 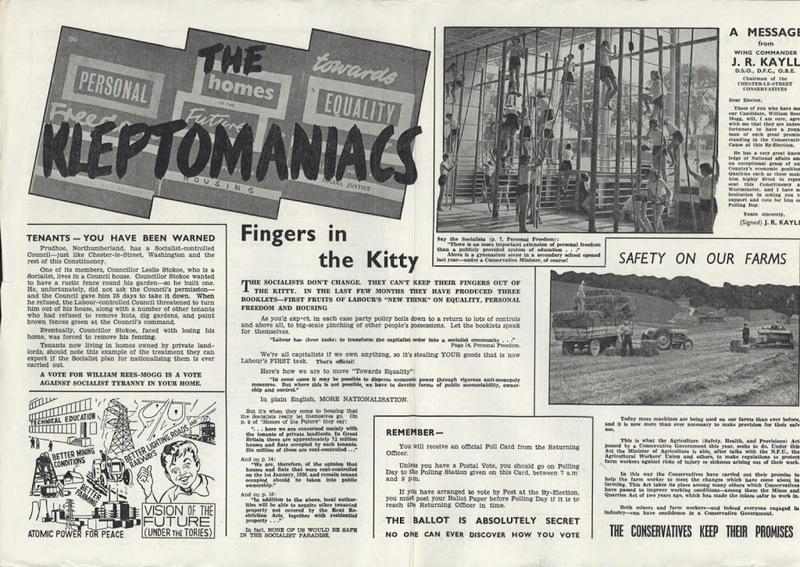 As with previous years’ releases, the sheer bulk of the papers now available originate with the extensive research undertaken by the Conservative Research Department. The original letter books of CRD Desk Officers and Subject Specialists which are now released, cover the policy areas of Agriculture, Defence, Economic Policy, the Environment, Europe, Home Affairs, Foreign Affairs, Health, Trade & Industry, and Transport. 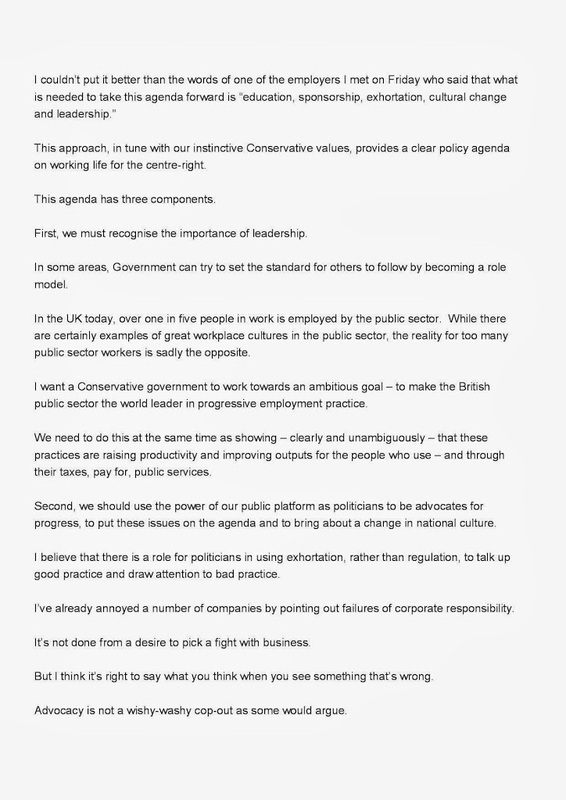 The numerous and detailed briefs prepared by the Research Department for Conservative MPs prior to parliamentary debates provide evidence of the Conservative Party’s approach to the whole range of parliamentary business during this period. 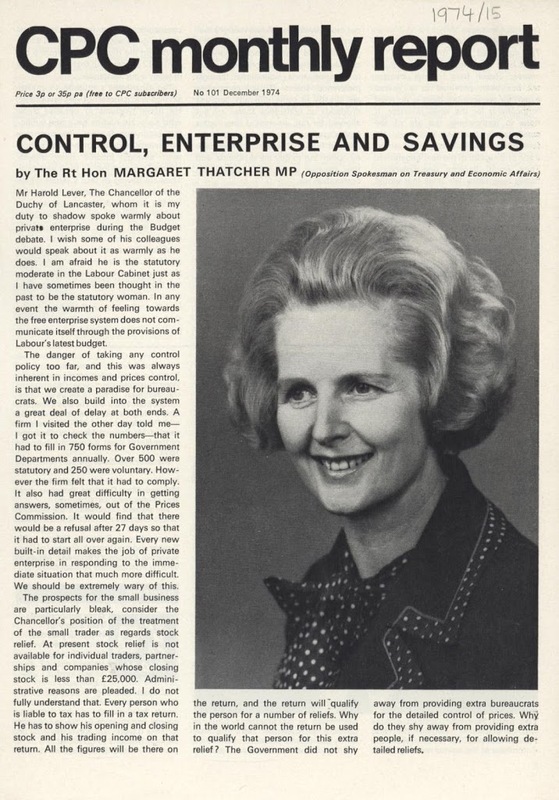 Together these papers form the essential core material for anyone studying the early Thatcher years. 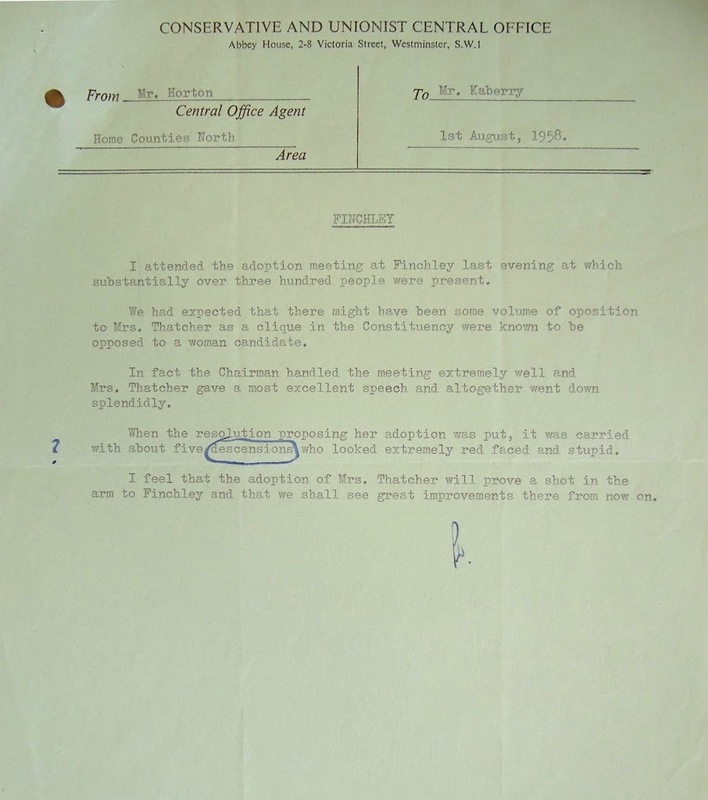 Anyone interested in consulting these papers may do so by contacting the Archivist. Conservative speeches ‘erased’ by the Party safe at the Bodleian Library! 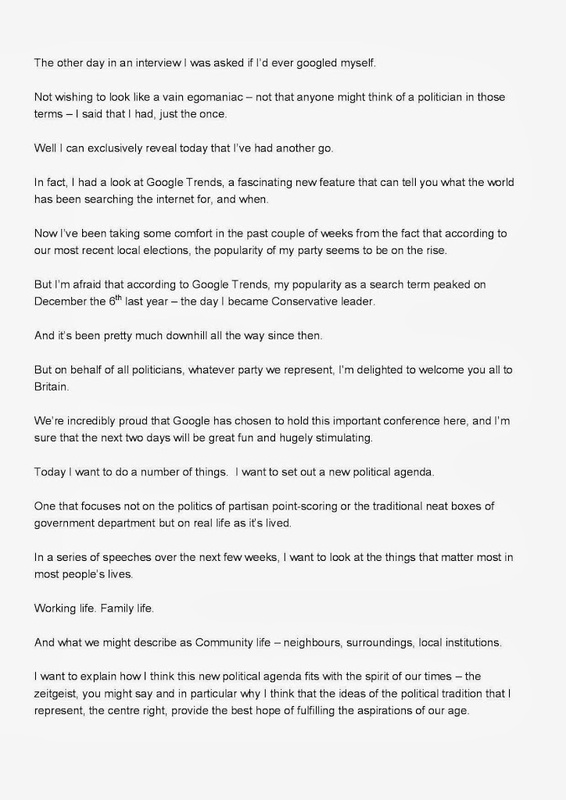 Following the furore over the past two days concerning the revelation in Computer Weekly that the Conservative Party has ‘attempted to erase a 10-year backlog of speeches’ by removing them from its www.conservatives.com website, the Conservative Party Archive seeks to allay the fears expressed by a number of historians and political commentators. 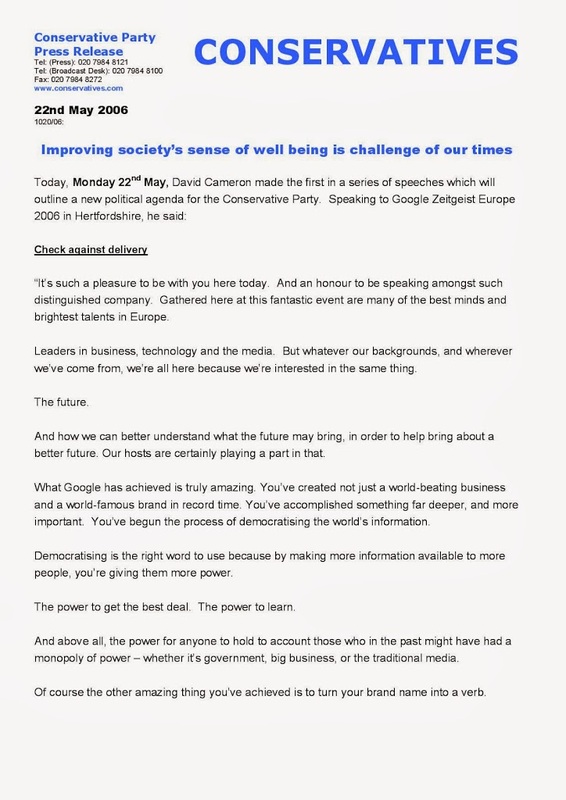 Both the BBC and The Guardian amongst others have reproduced this story, giving the impression of a deliberate attempt by the Conservatives to purge ten years’ worth of past speeches likely to cause embarrassment. 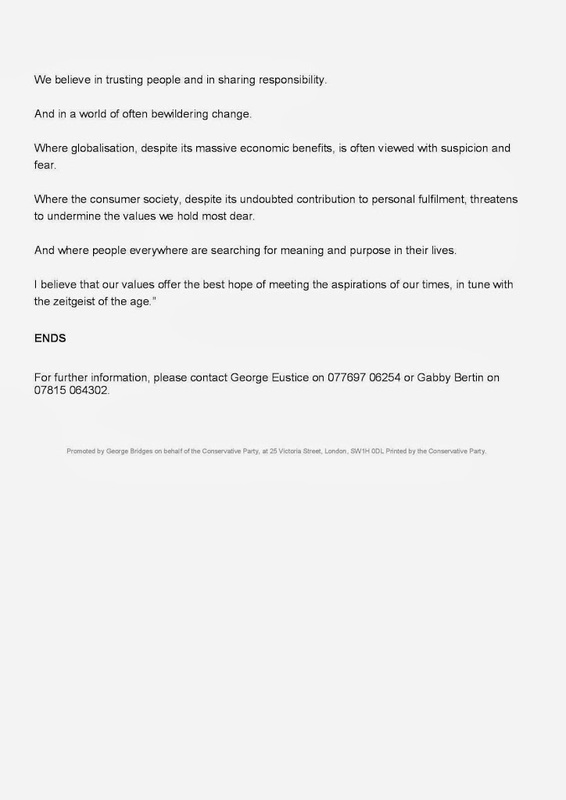 However, as disappointing as it may seem to many conspiracy theorists, these speeches are all safely in our care at the Bodleian Library in Oxford, and still freely available to anyone who wishes to consult them. 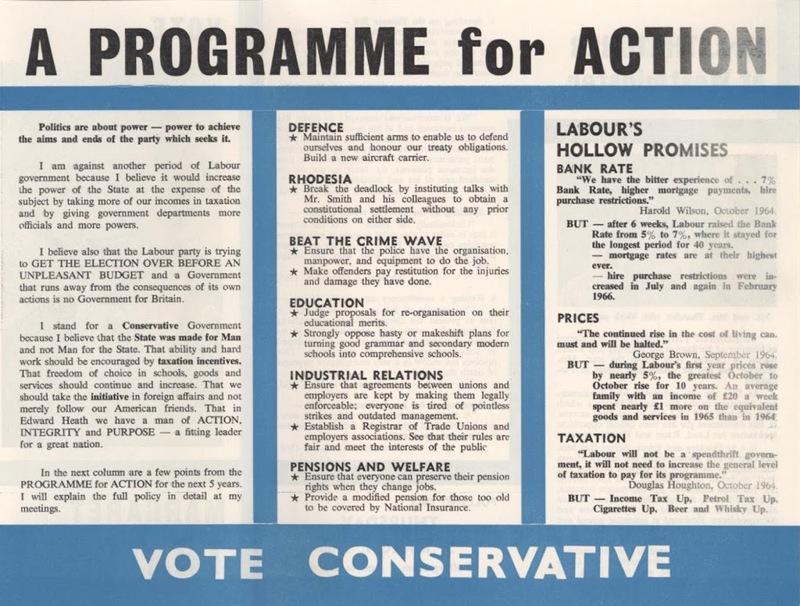 These speeches have been transferred periodically by Conservative Campaign Headquarters since the CPA was established at the Bodleian in 1978. The most recent transfer of speeches was made in May 2010. 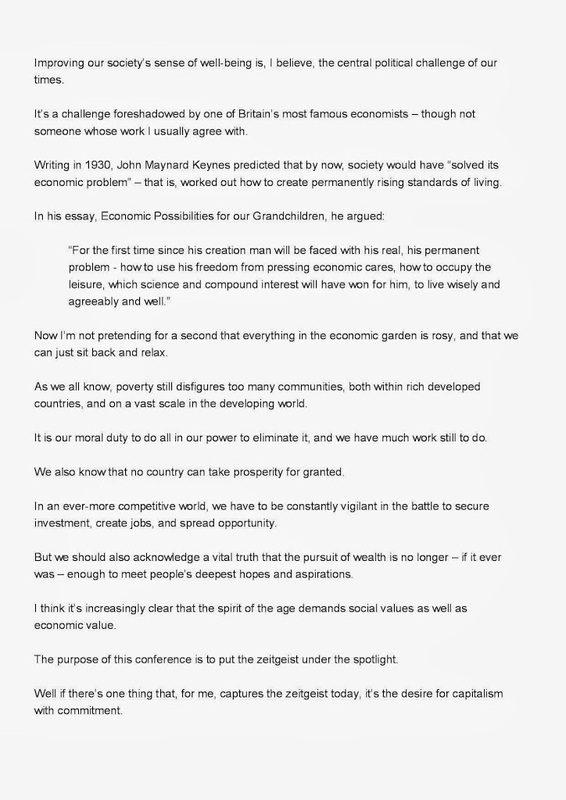 Further, over the past couple of years the CPA has been putting together a database of these speeches which will shortly be made available online via our own website, with the intention of opening up these speeches more fully to academic research. This database contains not only those speeches back to 2000, but all those held back to the late 1940s. 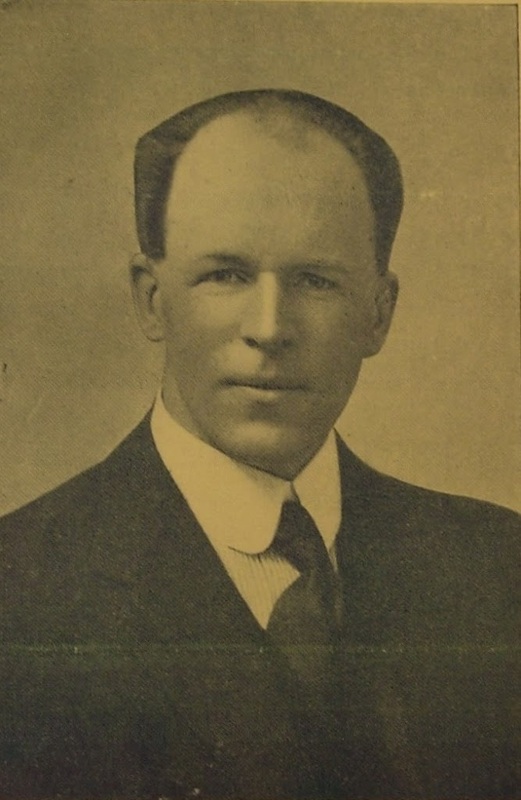 Earlier speeches dating back to the 1893 are also held, being dutifully recorded and published in the Party’s official journal of record National Union Gleanings (from 1912, known as Gleanings & Memoranda, from which this blog takes its name). Extracts from the draft database, providing lists of speeches held by specific individuals, are already available upon request, prior to it going live. Ultimately, when funds allow, the intention is to enable free-text searching of all the Party’s vast number of speeches, online, and free-of-charge. 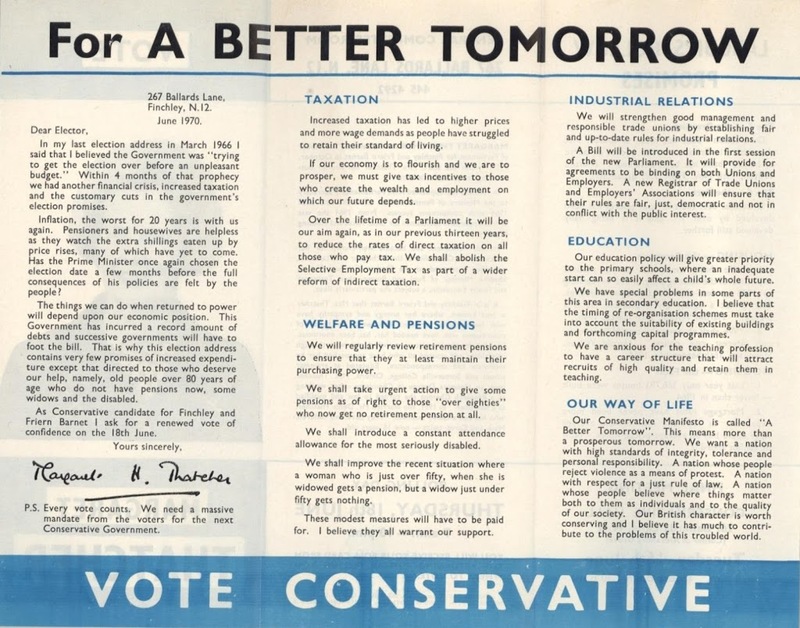 Both the Conservative Party Archive Trust and the Bodleian Library are committed to improving access to, and promoting use of, the rich documentary heritage of the Conservative Party which is in its care. 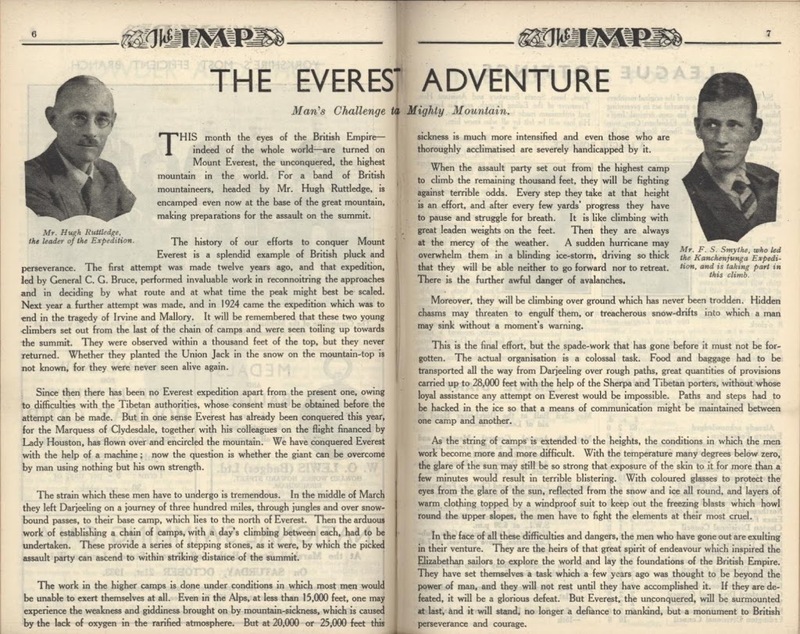 In this 60th anniversary year of Hillary and Tenzing’s successful ascent of Everest in 1953, The Conservative Party Archive looks back to an attempt made 20 years earlier, which was publicised in the May 1933 issue of The Imp. In May 1933, Hugh Ruttledge, then a 43 year-old with a long career in the Indian Civil Service was chosen to lead the first British attempt on the mountain since the ill-fated expedition of Mallory and Irvine in 1924 which had cost both men their lives. 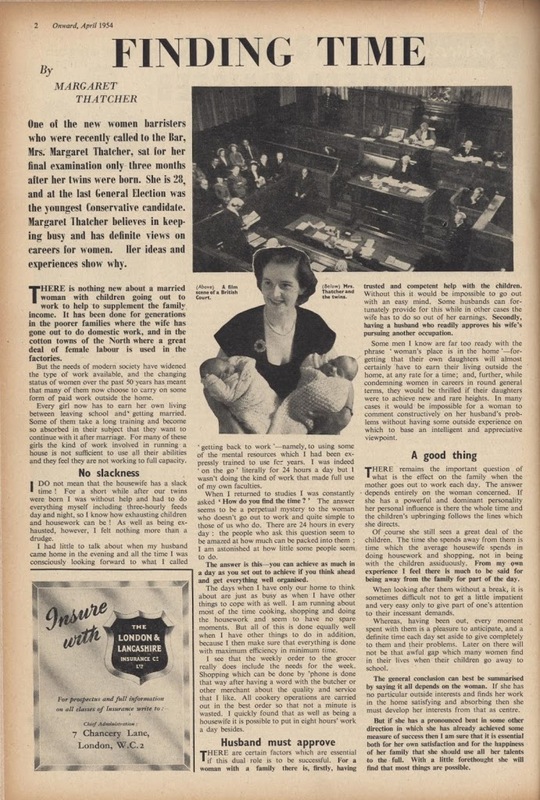 The Imp was the monthly newsletter of the Junior Imperial League – the Conservative Party’s youth wing which was re-modelled after the War as the Young Conservatives. 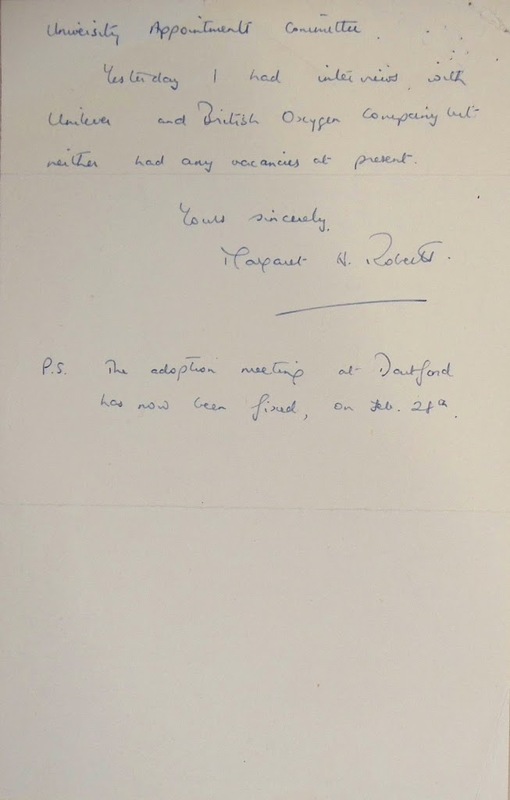 Interestingly, Ruttledge, who went on to lead a second attempt on Everest in 1936, had rejected Tenzing Norgay for the Sherpa team which accompanied him. 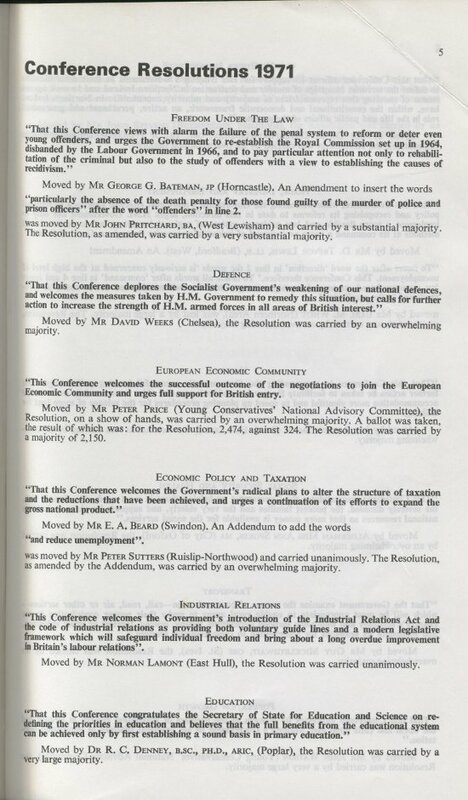 18th April sees the 90th anniversary of the formation of the 1922 Committee or, to give it is full name, the Conservative Private Members (1922) Committee, which held its first meeting on this day in 1923. 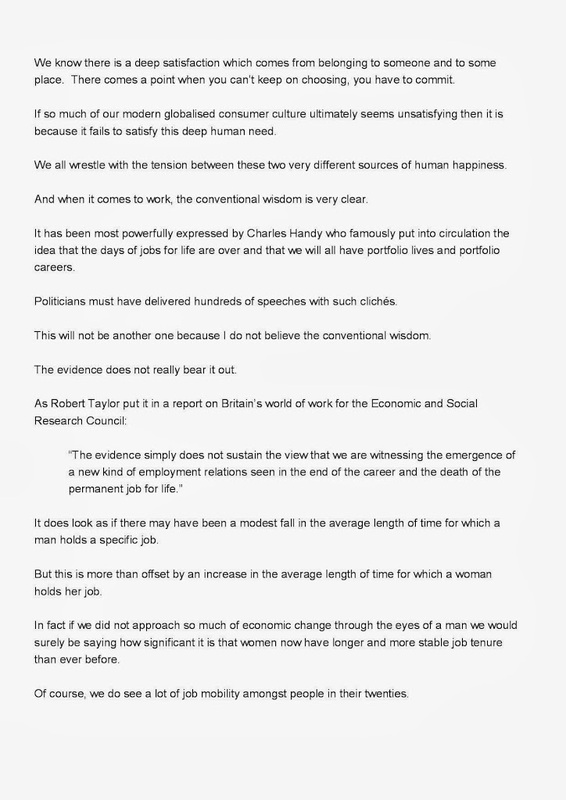 As Lord Norton makes clear in his just-published The Voice of the Backbenchers. The 1922 Committee: the first 90 years, 1923-2013 (Conservative History Group, 2013), the Committee was not named after the famous meeting of Conservative MPs held at the Carlton Club in October 1922 which ended the Lloyd George coalition, but after the intake of MPs first elected at the November 1922 General Election. 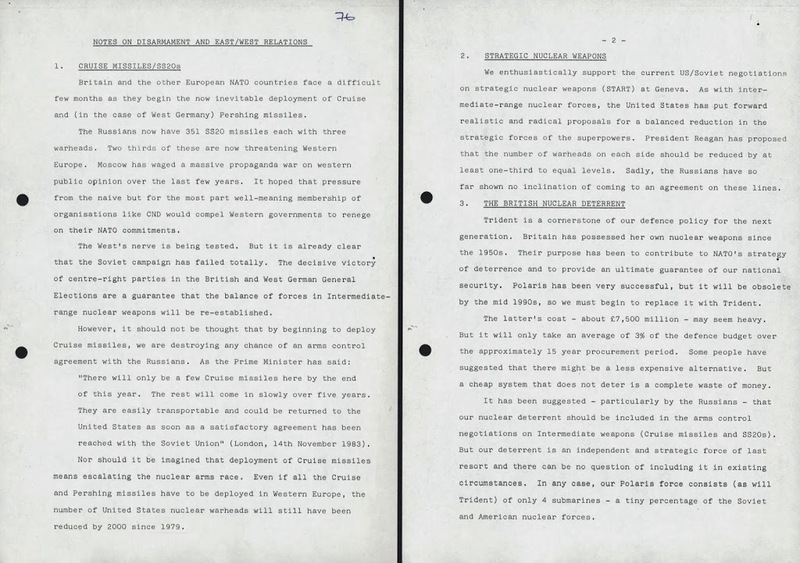 The minutes of the 1922 Committee dating back to 1923 are held in the Conservative Party Archive at the Bodleian Library, Oxford (see catalogue). 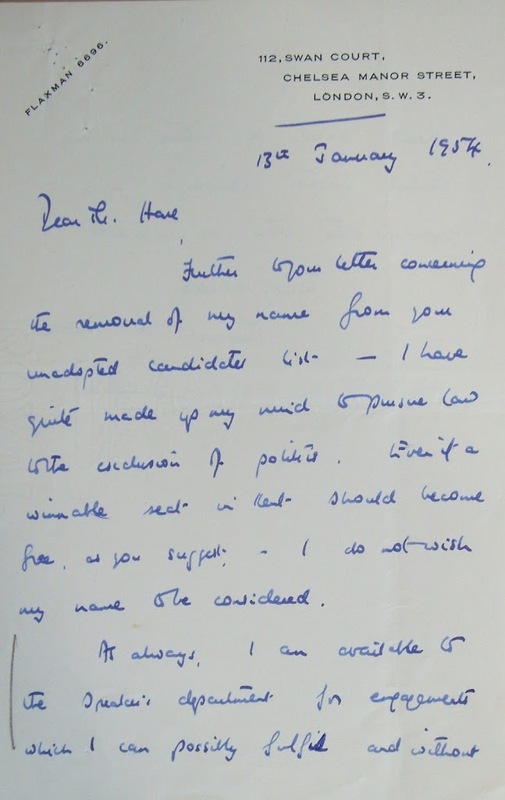 Lady Thatcher, who died on Monday, was part of a distinguished line of twenty six British Prime Ministers educated at Oxford University, where she studied Chemistry at Somerville College between 1943-1947 under the supervision of Dorothy Hodgkin, with whom she continued an occasional correspondence well into the 1980s (Hodgkin Papers, and Additional Hodgkin Papers, Bodleian Library). Her political career is fully captured in documents held within the Conservative Party Archive at the Bodleian, from canvassing in Oxford during the 1945 General Election campaign and her tenure as President of the Oxford University Conservative Association in 1946, through her long struggle for election to Parliament, her holding of a range of junior Ministerial and Opposition posts from 1961 leading to her appointment to Heath’s Shadow Cabinet in 1967, as Education Secretary in the 1970-1974 Conservative Government, Leader of the Conservative Party from 1975, and onward through her tumultuous period as Prime Minister, 1979-1990. 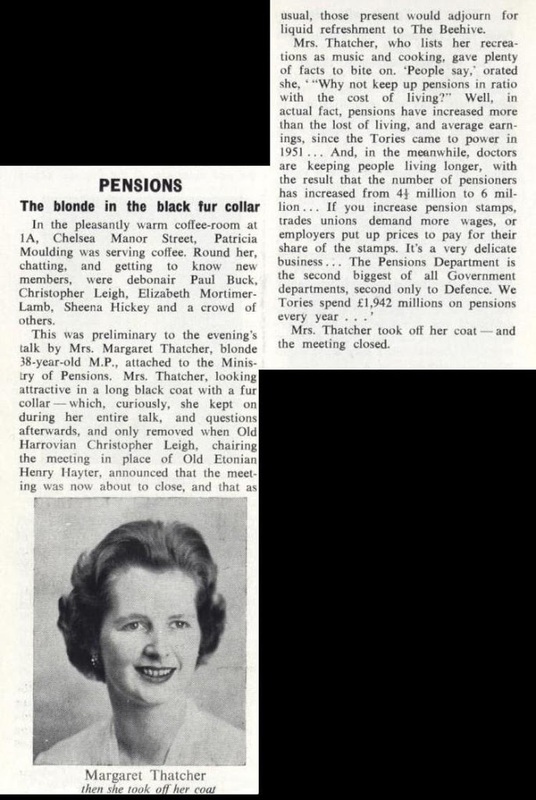 Below is a chronological selection of material from the Conservative Party Archive which illustrates Thatcher’s rise through the Conservative Party ranks between 1949-1979. 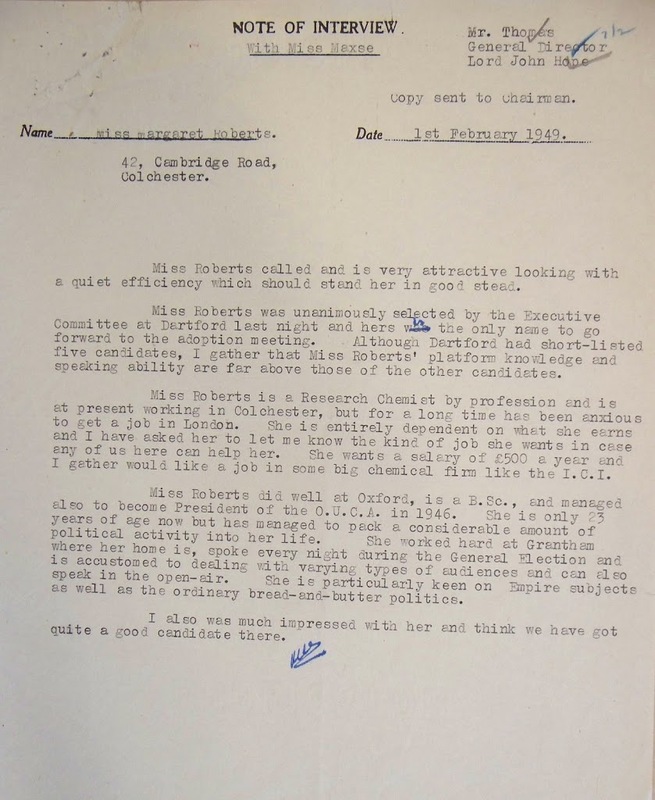 Letter from Margaret Roberts to Conservative Party Vice-Chairman Miss Maxse dated 15/02/1949 which accompanied her application form to become a Prospective Parliamentary Candidate. 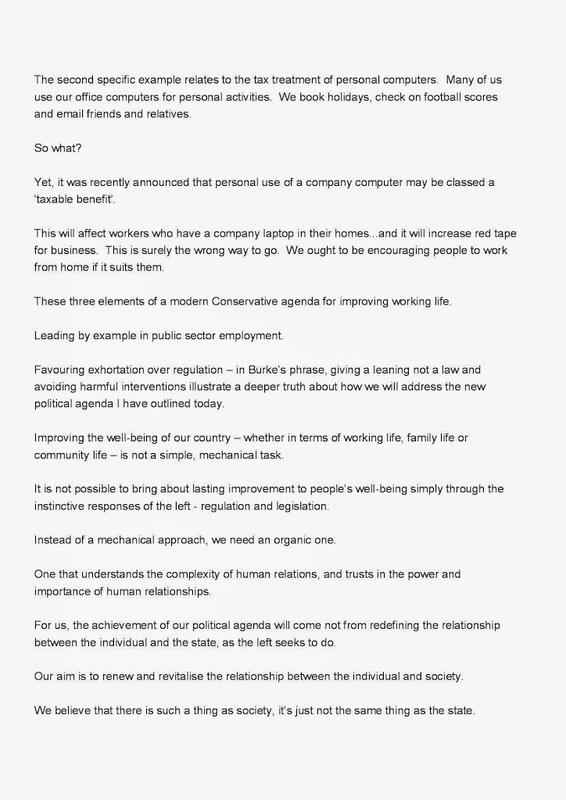 She mentions the rejections which she had received in response to applications for research posts with Unilever and the British Oxygen Company, as well as the forthcoming adoption meeting by Dartford Conservative Association. 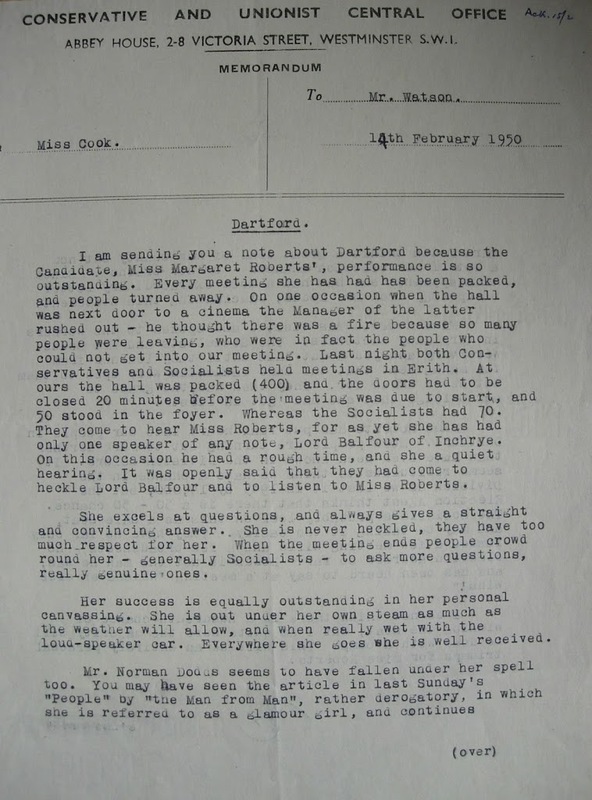 Margaret Roberts’ election address, Dartford, 1950 General Election. She was the only female candidate at that election, and at that time, the youngest ever Conservative woman to stand. 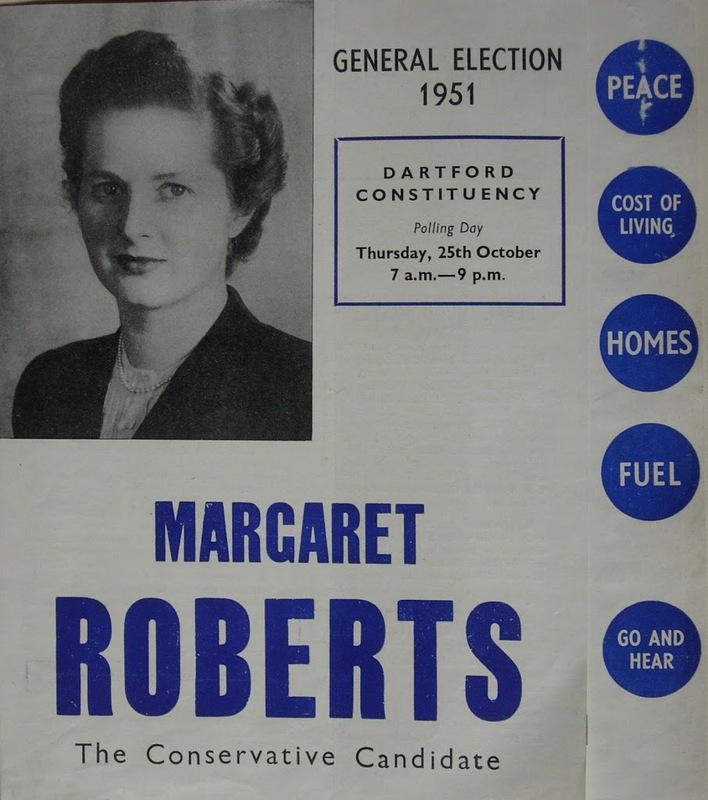 Margaret Roberts’ election address , Dartford, 1951 General Election. 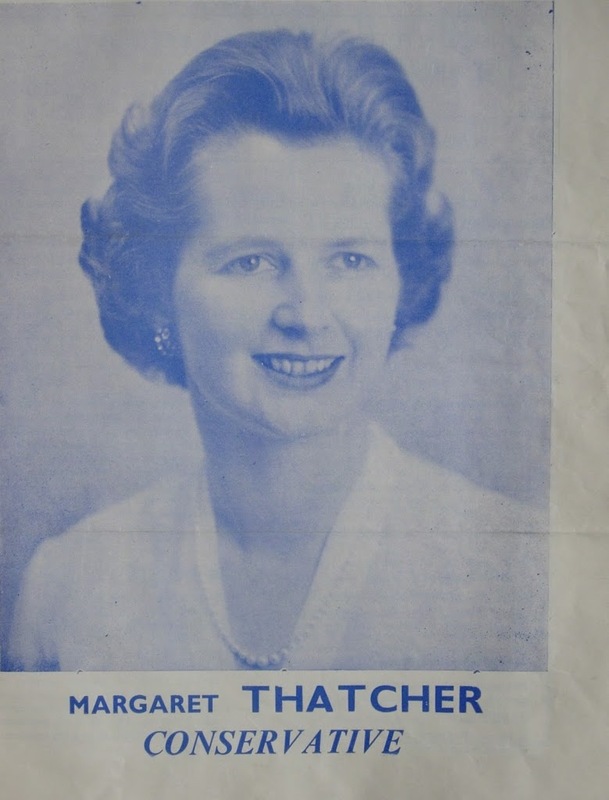 Despite her defeat in 1950 she was re-selected as the Conservative candidate. 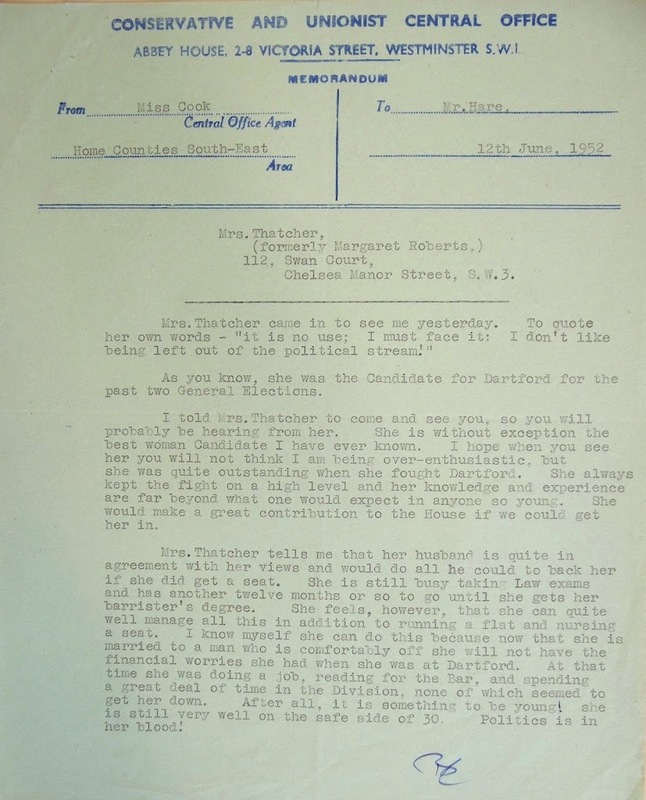 Memo from Area Agent Miss Cook to John Hare, Conservative Party Vice-Chairman, following her interview with Margaret Thatcher on 11/06/1952, concerning Thatcher’s renewed desire to become a parliamentary candidate following her marriage: To quote her own words – “It is no use; I must face it: I don’t like being left out of the political stream”. 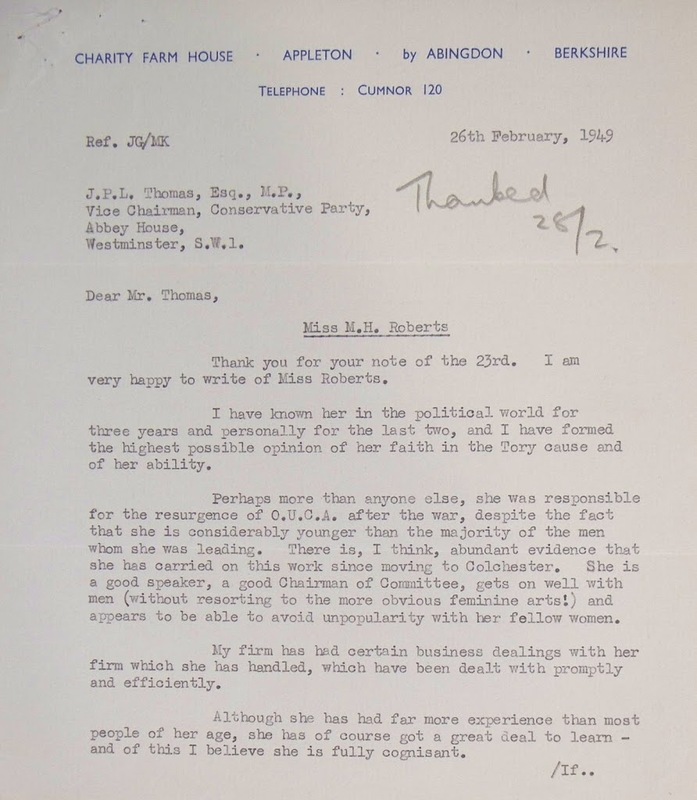 On 22 March 1963, British Secretary of State for War John Profumo made a statement in the House of Commons in which he declared, ‘There was no impropriety whatsoever in my acquaintanceship with Miss Keeler’. 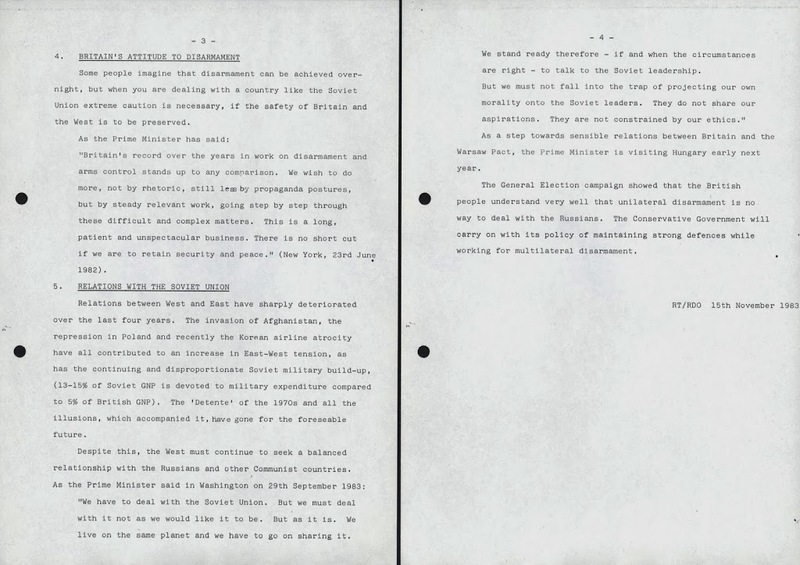 Profumo had been implicated in an affair with Christine Keeler, a model whose relationship with a senior Soviet naval attaché made her connection to the Secretary of State for War concerning (read the full statement on the Hansard website). 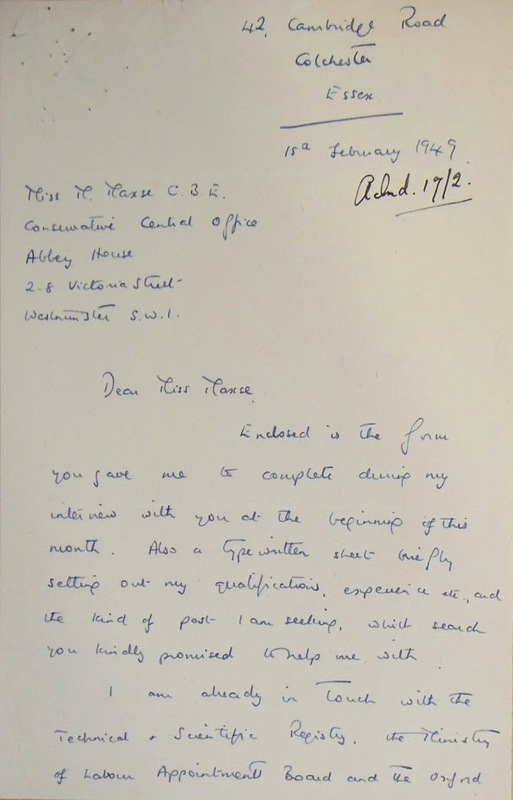 In June 1963, Profumo resigned, admitting that he had misled the House in his testimony. The scandal rocked the Party and damaged the reputation of its leader, Harold Macmillan. 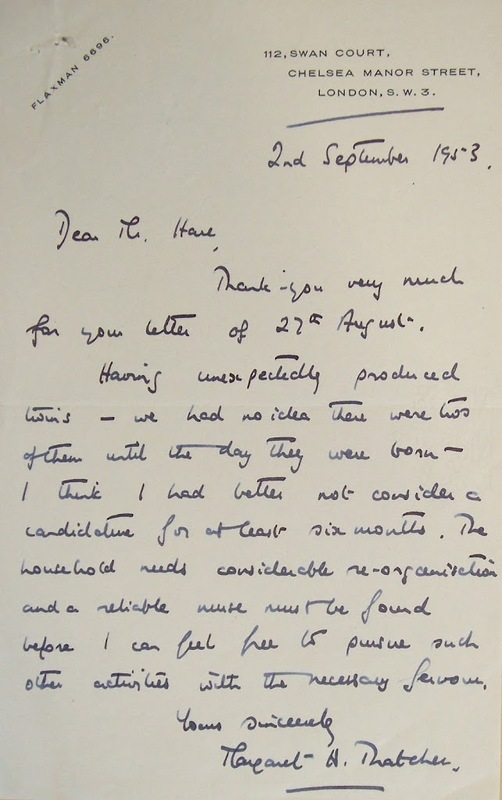 Macmillan resigned due to ill health in October 1963; many felt the crisis had played a role in his illness. 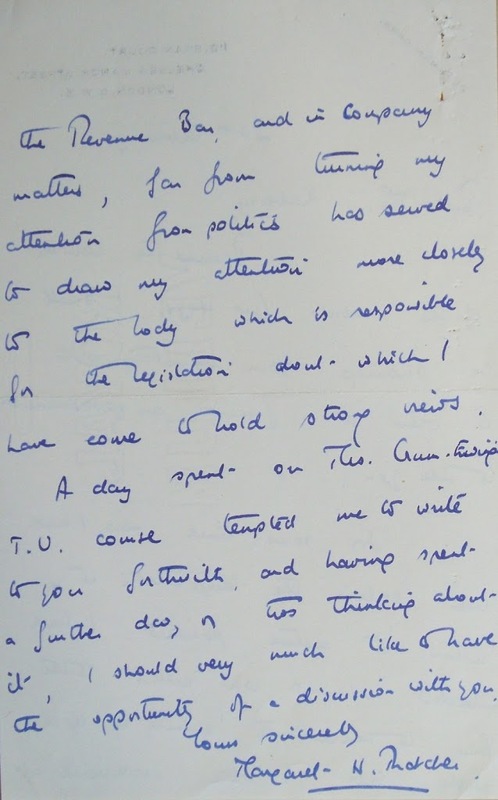 The reports surrounding the 1963 Conservative Party Conference include motions of support from various constituencies, though letters from area agents and the public in the summer of 1963 show mixed feelings. 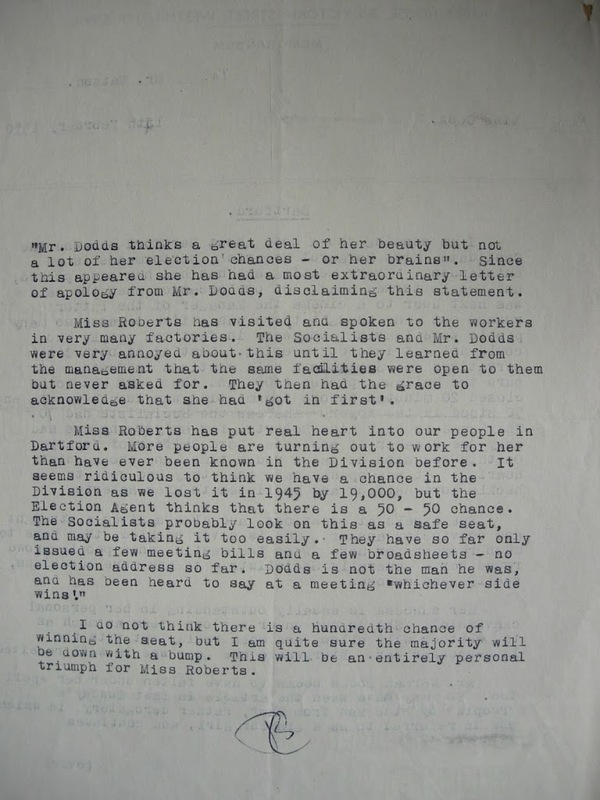 The Archive contains relatively little about the affair, but there are a few bits and pieces that shed light on the Party’s stance. 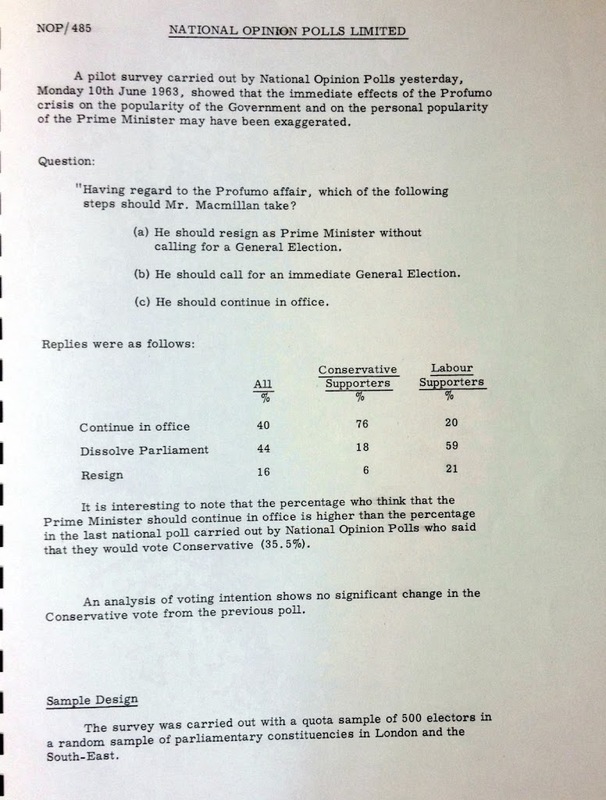 The Party conducted a survey to determine how sentiment towards Prime Minister Macmillan had changed; although it showed that 44% (59% of Labour supporters) called for a General Election, the survey report indicated little concern, stating that it showed that ‘the immediate effects of the Profumo crisis on the popularity of the Government and on the personal popularity of the Prime Minister may have been exaggerated.’ Various meeting minutes make it clear that the affair was discussed in detail, if not the details of the discussion. Though the scandal eventually blew over, its effects were far flung and contributed to significant changes in Party leadership. It has been reintroduced to the public through various films, plays, songs and memoirs, from the 1989 film Scandal to mentions in tracks by Billy Joel and The Clash. Profumo retired from politics after his resignation, but devoted the remainder of his life to volunteer work in London’s East End. He died in 2006. Today marks 50 years since the death of William Beveridge, the British econonomist and social reformer whose Beveridge Report formed the basis of Britain’s welfare state. 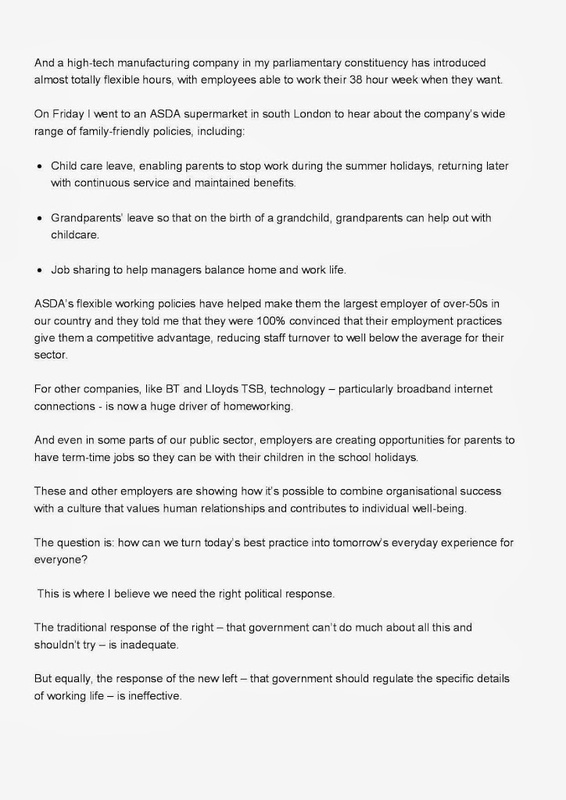 We’ve covered Beveridge’s report before on this blog, and we encourage you to take a look at the full story. There are a handful of upcoming events in Oxford that may be of interest to historians and those with an interest in Conservative Party History. A joint event staged by the Bodleian Library, the History Faculty, University of Oxford, and Oxford University Press/Oxford Dictionary of National Biography marking the life of Jim Callaghan, Baron Callaghan (1912-2005). A leading campaigner against British colonialism during the 1950s, Callaghan became one of the key figures in the Wilson governments, 1964-70 and 1974-76, holding all three of the most senior Cabinet posts: Chancellor of the Exchequer, Home Secretary, and Foreign Secretary. From 1976 to 1979 he served as Prime Minister. In retirement he was an active Elder Statesman. His private papers in the Bodleian Library are a major historical resource. Speakers include Baroness Jay, Lord Hattersley, Lord Morgan, and Andrew Smith, MP. The event will be chaired by Dr Lawrence Goldman, editor of Oxford Dictionary of National Biography. There will be a reception at 6.45pm in the Divinity School at the Bodleian Library, Oxford. For further information, please see the event page. Alistair Cooke, Lord Lexden, joins Frank Field in an examination of the life and politics of Enoch Powell, who would have been 100 years old in 2012. 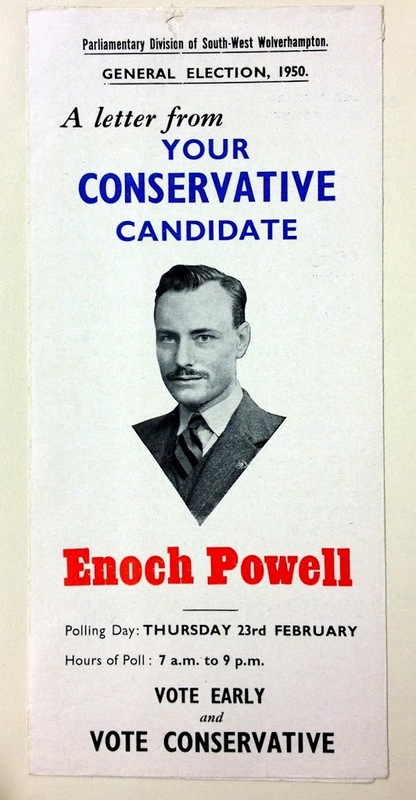 Both politicians have contributed to Enoch at 100, a collection of essays to mark the anniversary of the birth of one of the 20th century’s most controversial politicians. The essays aim to judge whether Powell’s views still have relevance today and cover areas such as the European Union, constitutional reform, immigration and social cohesion, and defence and foreign policy. Alistair Cooke, Lord Lexden, is a political historian and official historian of the Conservative Party and occasional contributor to this blog. 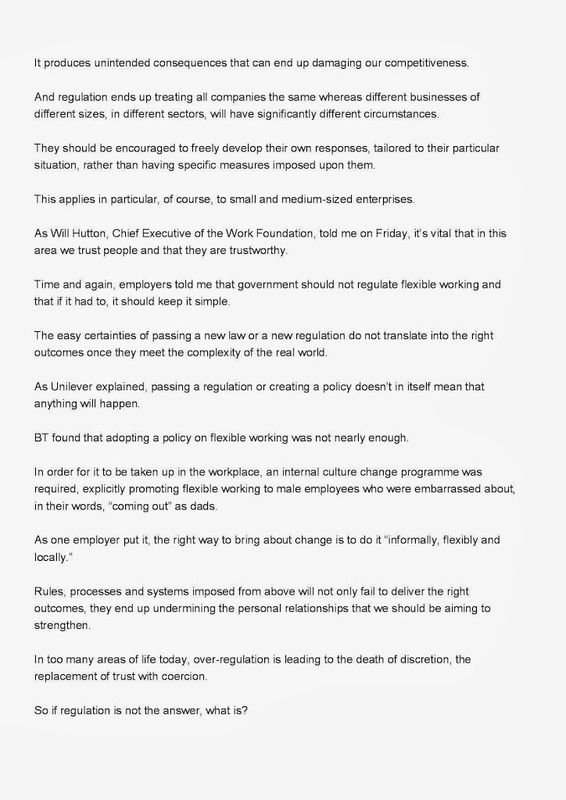 Frank Field is the well-known Labour MP for Birkenhead. The conversation is chaired by Richard Ritchie, archivist for Enoch Powell, editor of two books of Enoch Powell’s speeches, and also a contributor to Enoch at 100. To book a place, please visit the Oxford Literary Festival page for the event. 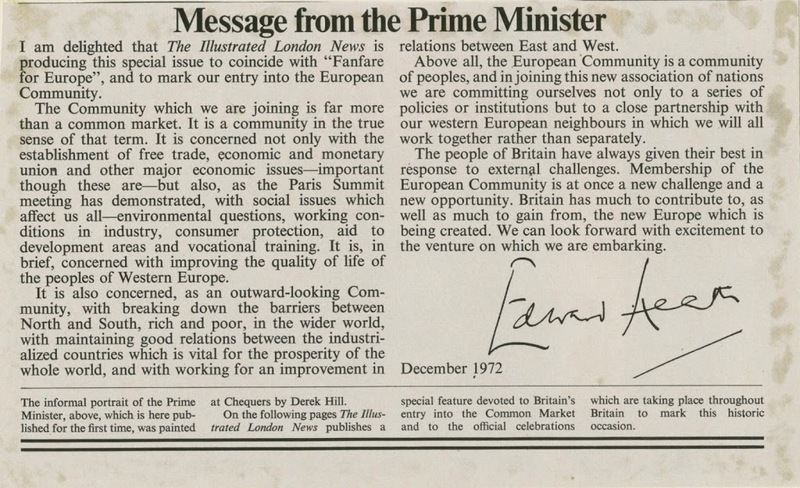 On 1 January 1973, after decades of discussion and frustration, the United Kingdom became a full member of the European Economic Community. The successful application was a long time coming. 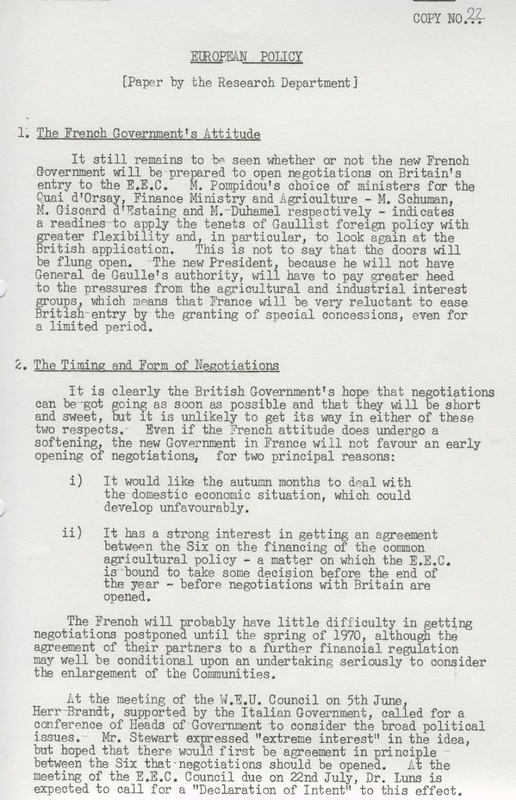 The UK had applied for membership in 1963 and 1967 but had been rejected – largely due to the hesitance of Charles de Gaulle, the French president. 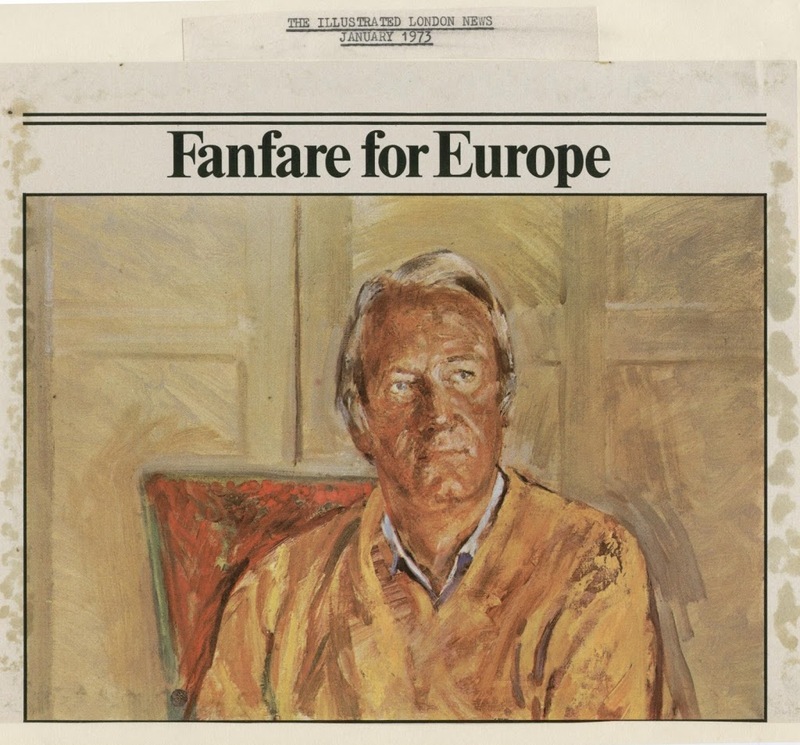 When Edward Heath became Prime Minister in 1970, he continued to press for membership. 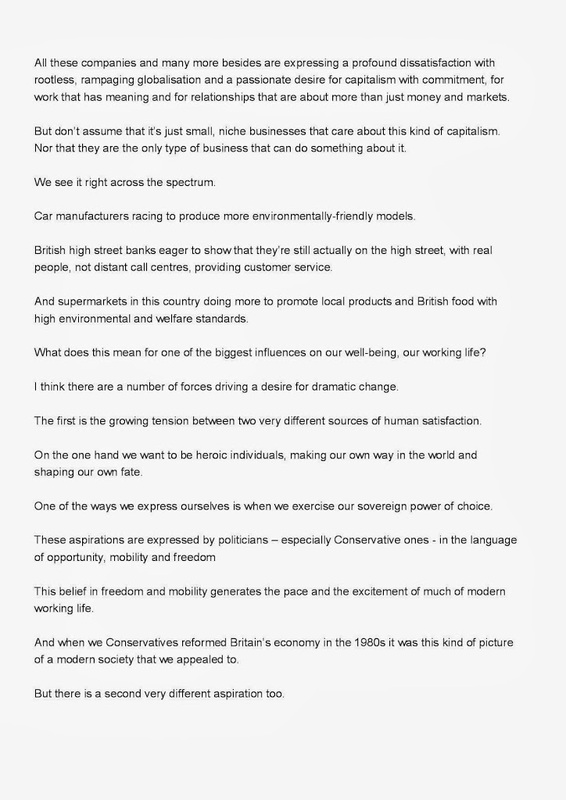 In July 1971, Heath told a Central Council meeting, ‘We believe, as we stated in the White Paper, that our people will be more prosperous, our economy and our industries stronger as a result of joining the European Communities’. 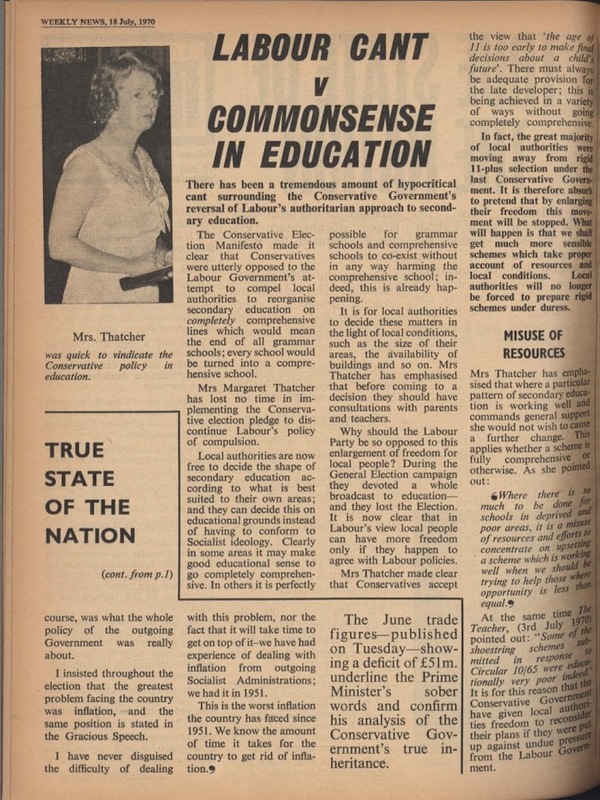 In fact, 1971 became a year of much discussion and consultation, from the launch of the Government’s White Paper to the vote at the Party Conference in October – the Party’s Weekly News called it ‘the summer of the Common Market. 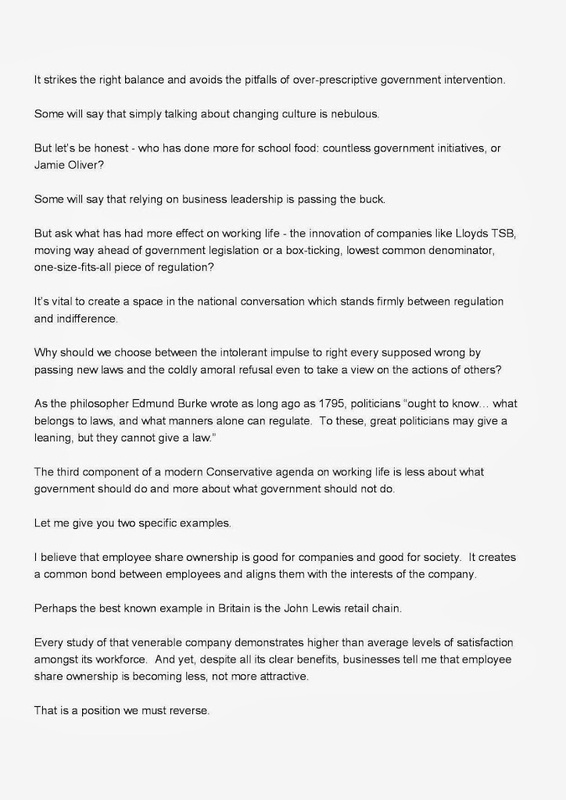 Of the great debate’ (PUB 193/23). 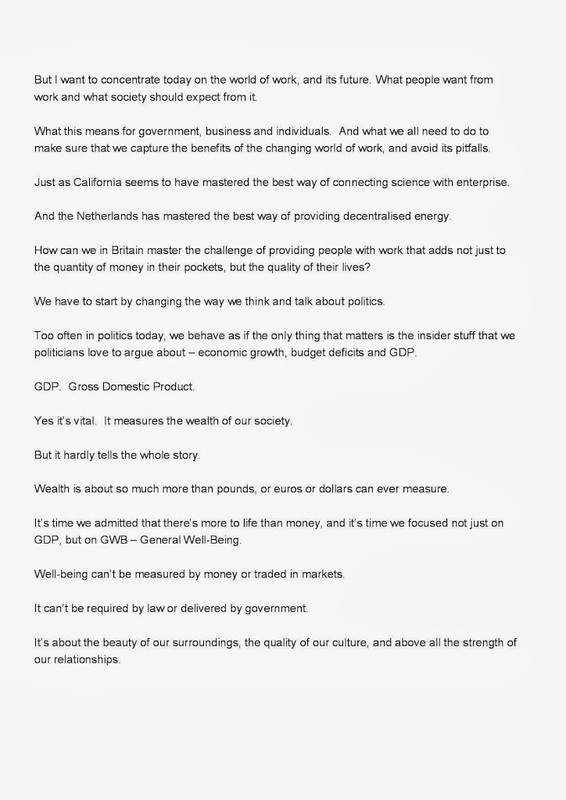 Party members, the Opposition and the public all had many questions about what EEC membership would mean for the UK. 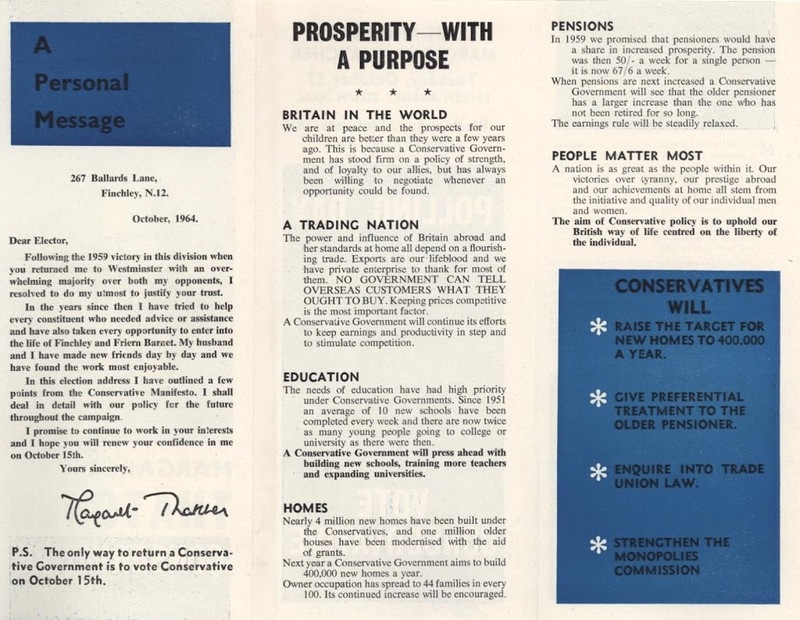 Heath’s Central Council speech was met by no fewer than 29 detailed questions from the audience, and the Conservative Party Archive holds reams of correspondence about terms of membership, debates over the possibility of a referendum and discussion of Conservative policy. 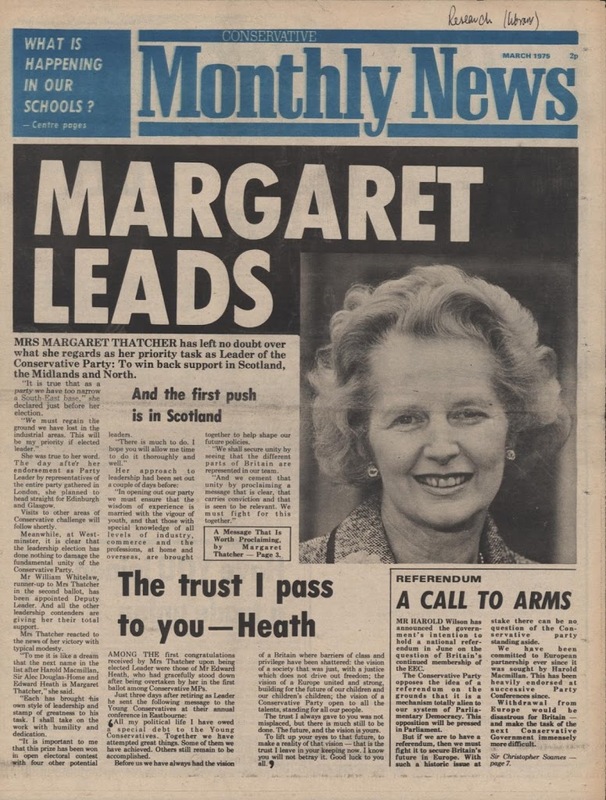 Heath stopped short of holding a referendum, however; the UK did not hold a public vote on the EU until 1975. 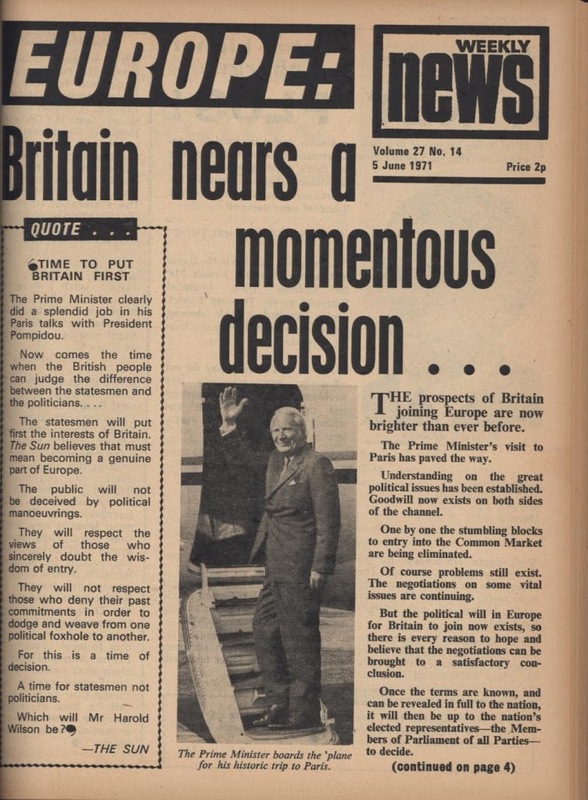 On 1 January 1973, newspapers nationwide celebrated the work Heath did in bringing the UK into the EC, and the Union Jack was raised in Brussels to celebrate the occasion. 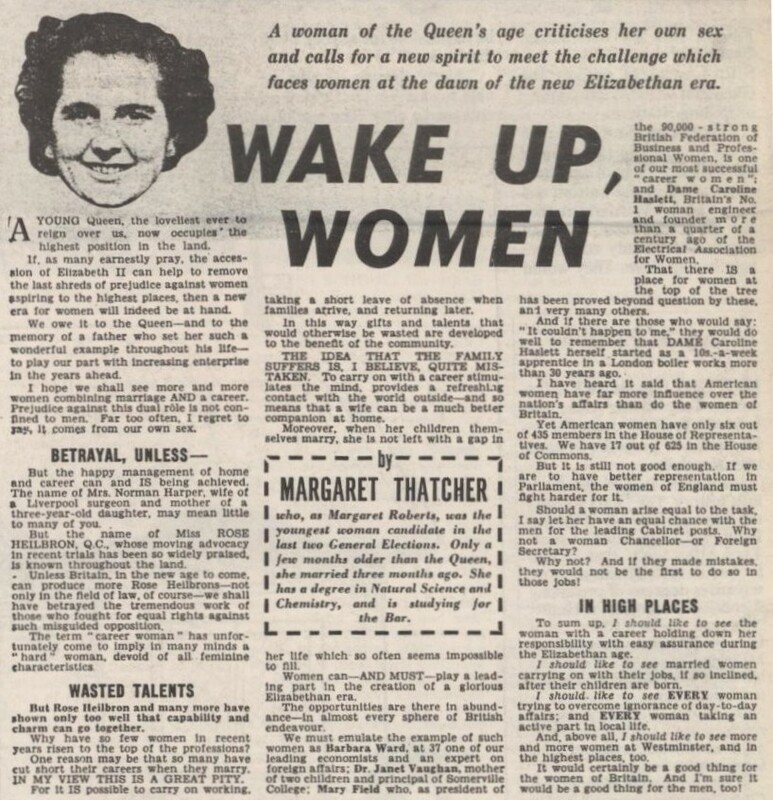 Over the following months, however, the Conservatives – and indeed, the UK political body as a whole – turned to the practical issue of working as a part of the EEC government. 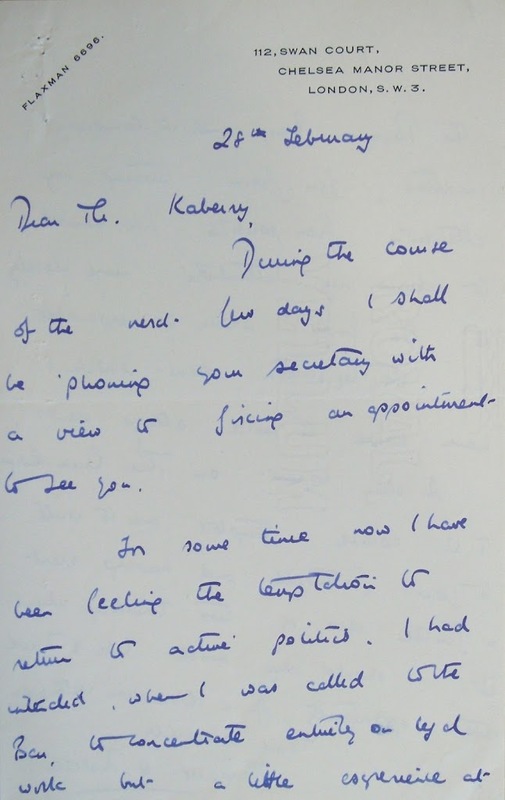 This was no small matter; the UK sent upwards of 1,000 civil servants to Brussels, and the Conservative Party Archive’s papers explore the negotiations and practicalities of EEC participation. The CRD, for example, proposed that its role in relation to European Parliament should be as a source of political advice as well as a liaison between backbench members and MEPs (CRD 4/22/8). 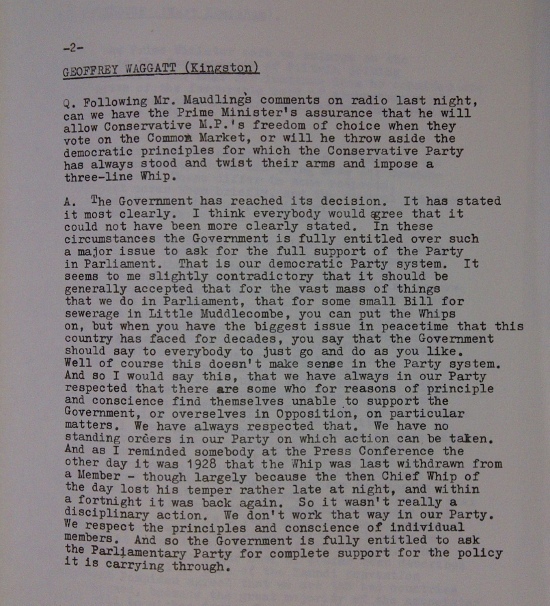 Central Office explored direct elections throughout the 1970s (CCO 20/32) and debated the possibility of a referendum. 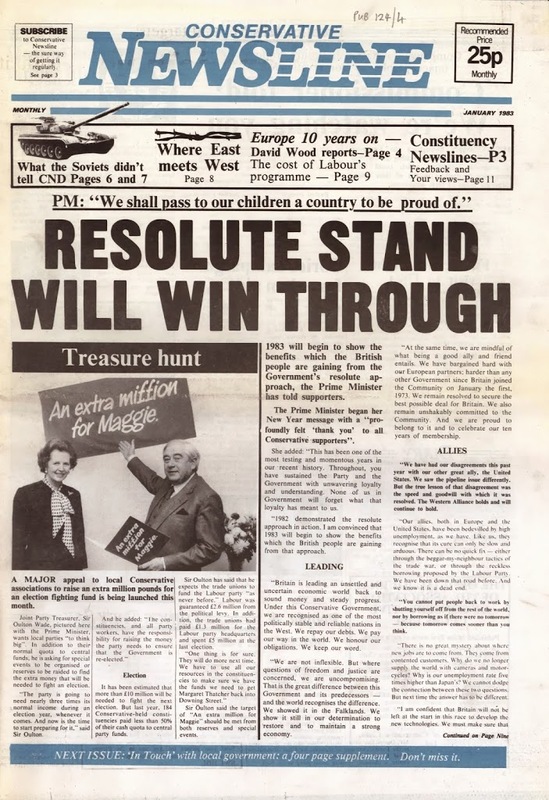 British MEPs joined those from Denmark to form the European Conservative Group – later the European Democratic Group – on 16 January 1973, and some of the group’s working papers can be found in CCO 508. The UK’s membership in the European Union remains a subject of discussion and often debate. As Cameron’s government explores the possibility of an EU referendum in coming years, the history of the UK’s membership and previous votes, the CPA provides much fodder for those interested in Conservative policy and position toward the EEC/EU. Though recent files are closed, those up to 1982 provide a rich perspective on the UK’s first few years in Europe. Lord Rees-Mogg (obituary, Dec.31) worked extremely hard to establish himself in politics, his first career choice. He possessed impressive credentials by the time he made his successful application to join the Conservative Party’s official candidates’ list at the end of 1955. During the general election earlier that year he travelled 1400 miles at his own expense speaking in a wide variety of constituencies, often at open air meetings. He also knocked on countless doors, believing “ personal canvassing to be of first importance”. Vigorous electioneering reassured those who might otherwise have regarded him as too intellectual as a result of the frequent lectures he delivered as part of the Party’s ambitious post-war political education programme, established by his mentor, Rab Butler, with its headquarters at Swinton Conservative College in Yorkshire where he taught regularly. 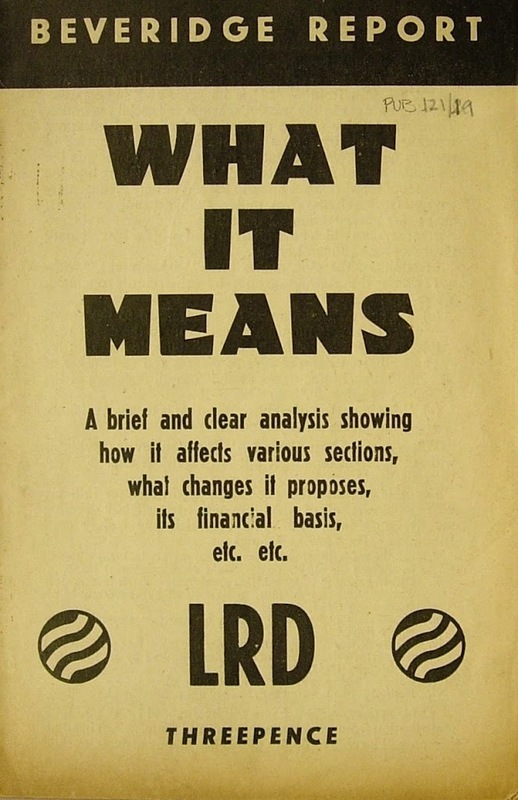 In 1956 he became a prominent member of a policy committee on the structure and accountability of the nationalised industries, chaired by Butler( who he always believed should have become Tory leader). 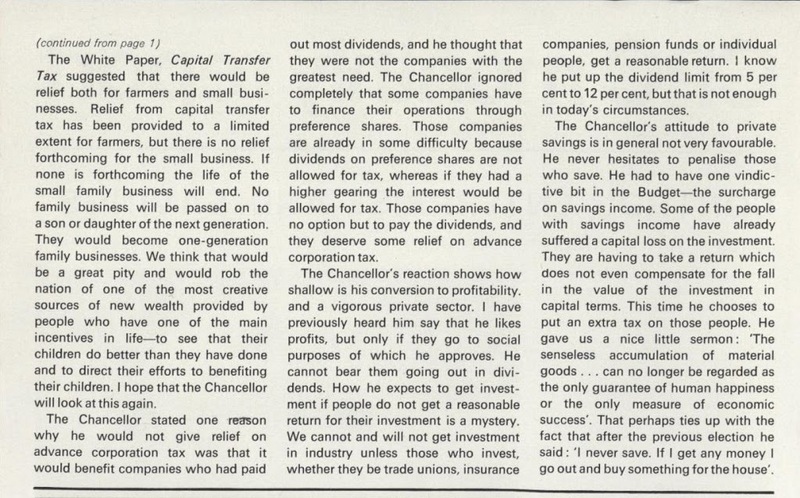 He declared that the time he was prepared to give the Tory Party was “ only limited by his work for the Financial Times”. 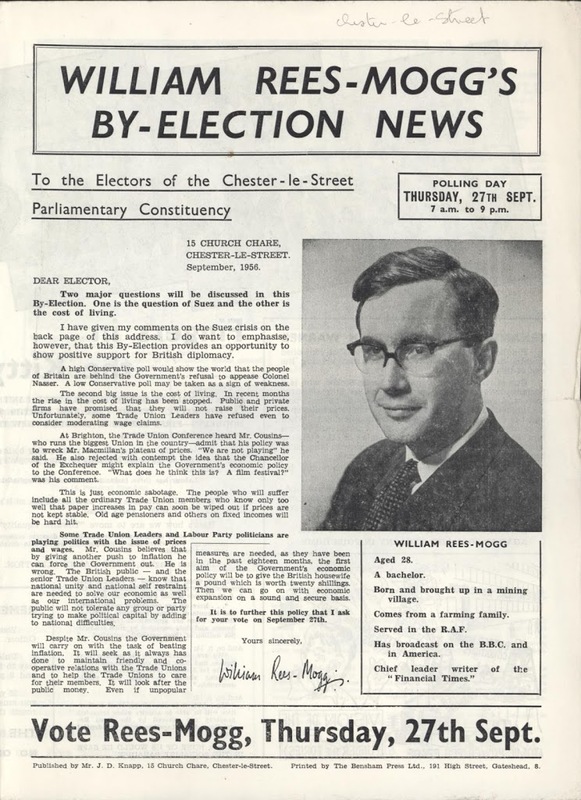 As the Conservative candidate in Chester-le-Street he won golden opinions from the hard-bitten senior Party agent who oversaw his first campaign there in 1956. 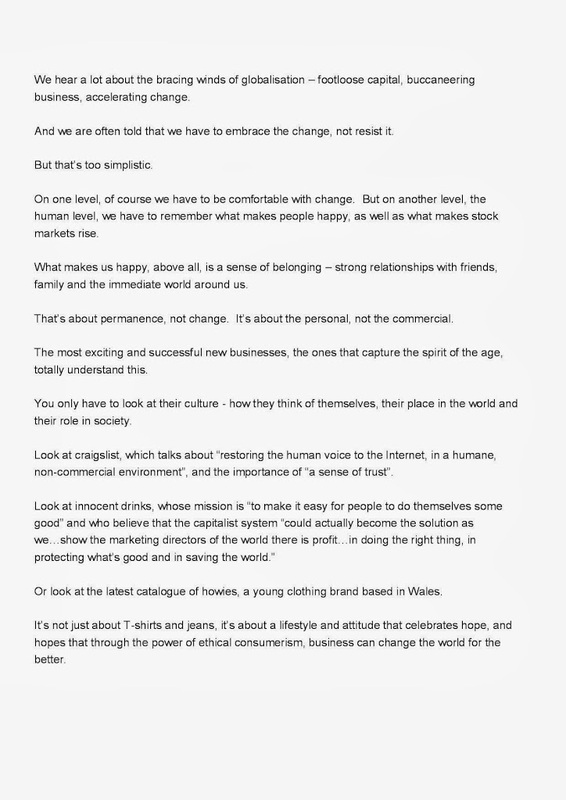 “ In the closing stages of his campaign he might almost have been described as outstanding. He was particularly strong in answering questions and always got the better of his questioner”. 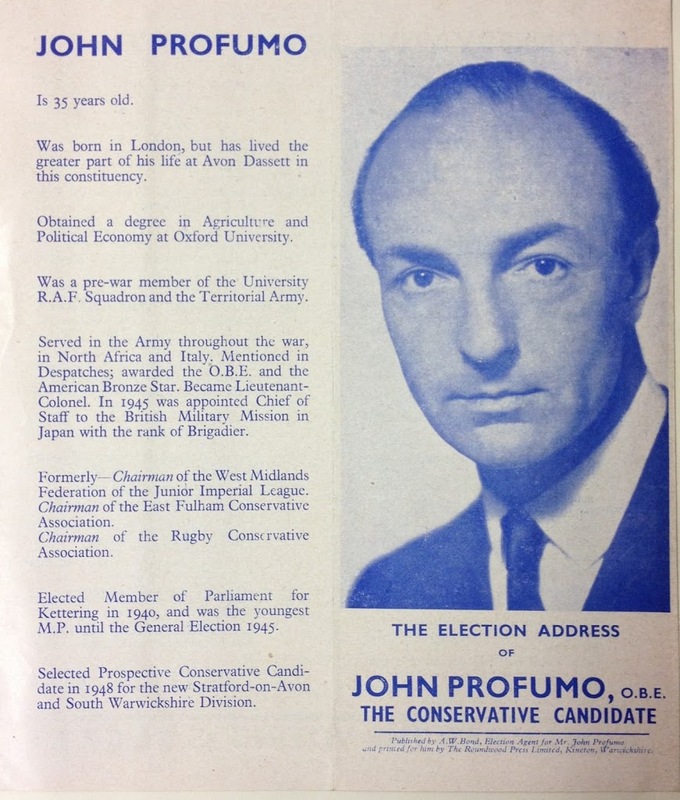 Even after the 1964 general election, when surprisingly he failed to be selected for a safe seat, he still retained hopes of a parliamentary career, stressing that he “ would give proper time to nursing a constituency” and “ would of course undertake personal canvassing”.